Pararshurama in Mahabharata: Find all detail about Mahabharata Pararshurama! The Sixth Vishnu avatar was Parashuram in Mahabarata ,he was son of Saptarishi Jamadagni and Renuka.Mahabarata Parasurama have two Danush were Vishnu danush and Siva Danush.he was livied in Treta yuga.he recived Danush (axe) after doing pemance to Lord Shiva. 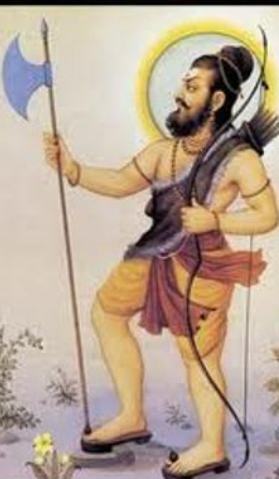 Mahabarata Parashurama played role in Mahabarata And Ramayana.Mahabarata Parashurama impressed Shiva and got Danush ,after long time its has given to Raja Janaka who put it for to open chanllange of strining it ,who one done this task will marry with janaka daughter Sita Devi,Lord Ram had broken this Danush who is Avatar of Lord Vishnu.then Ram marriage with Sita.When Mahabarata Parashurama knew that Siva Danush had broken by Ram then he have one Another Danush Vishnu Danush ,they given it to Ram .This danush helped when Ram Fights with Ravan. Mahabarata Parasurama had knew about the Mahabarata Kurukshetra war.he played a role as Karna guru.Pandavs sided guided by Lord Krishna ,Karna was so much worrior who was sided with Kaurava king Duryadhana who fought that he is agaist with Panadavs. We are representing the information about Pararshurama's role and Character in Mahabharat Characters.